All documents need to be certified by a clerk within five (5) years or a new document must be issued before requesting an apostille. Apostilles are obtained from the Secretary of State in the state it was executed. See the above example for clarification. The U.S. State Department’s list of state offices at “Apostilles/Document Authentication.” Select the relevant state from the drop-down menu. Please note that the Secretary of State regional office refers to the local state and representative, not the U.S. Department of State who is in the national/federal office. An apostille may be obtained from a Department of Foreign Affairs and Trade state or territory office. See the Australian government website, “Authentications and Apostilles” for details and locations. To obtain an apostille in Belgium or for a Belgian document, go to the ministry’s official page at “Légalisation de documents/Legalisation of documents,” choose the type of document and follow the instructions. Authentication of documents is free in Canada but wait time can be up to 15 days. See, “Authentication of documents” at Canada’s Foreign Affairs, Trade and Development website. Apostilles for documents originating in Greece are issued at KEP Citizen Service Centres. Call ‘1500’ or appear in person at any of their locations throughout the mainland and islands. For those abroad seeking apostilles for documents originating in Greece, inquire at the Greek consulate/embassy nearest your current residence. See “Legalisation of Documents” in English and Dutch from the Netherlands Ministry website. See “Legalization of Documents” from the Government Offices of Sweden website. See “Get a document legalised” at gov.uk. In the interest of brevity and time — i.e., how long it would take me to compile and continually update this article — apostille instructions and links are not listed for all 190+ countries. If your country is not included, please check with appropriate justice, registry or legalization authorities in your homeland. Image shows an apostille from California. The apostille from another state or country will look different. I was born in the state of Louisiana. However, I live in Michigan. I have a certified birth certificate from Louisianna. I have had it for a number of years. I was born in 1950. Do I have to get an apostille from the state of Louisiana on my birth certificate? Hi E, as I say in the article, it does not matter where you live now, it only matters where the document originates. Therefore, yes you do need an apostille from LA. I believe you can apply by mail; please use the underlined link provided in the article under the heading “In America” and look up their requirements. Well, the whole shenanigan should be enough to discourage most non-Greeks from getting married in Greece. I don’t know why they don’t simply say that only people with Greek documents can marry,as that presumably is the intent. 1. Apply for the long form birth certificate and letter of exemplification from New York by mail. 2. Upon receipt of these documents, send them back to the U.S. for Notarization. 3. Upon receipt of those documents, send the all back, once again to have an apostille applied. 4. Upon receipt of those documents, deliver all to the Ministry of Foreign Affairs to be translated into Greek. All this before I can use my birth certificate in any official capacity. That certainly does take the romance out of marriage. Next they’ll be doing this with passports! Hi V — Hello and thank you for sharing your experience. Unless they changed the rules, a relative you assign can also pick up a birth certificate and apostille a document for you, if you send them a completed application and write a letter. I realize that may not work for everyone since this relative would need to live in the relevant U.S. state and have time to help. If you’re getting married, you have much more bureaucracy ahead of you. Just know that you’ll get through it and it will be worth it. Congratulations! I think the usage in the US may differ from other countries. In the US, the apostille is used to certify that the document that has been notarized is authentic because the notary was properly authorized. So for example, a birth certificate copy would have a stamp and signature on it that it was an authentic copy, the first (county level) apostille would say the signature was of the person having the authority recited in the document and the second apostille would be at the state level and say that the person who executed the first apostille was duly authorized. If it was just a notary’s execution, the county would say that the notary was duly registered as a notary and the state level would say that the county clerk was the duly empowered clerk. Thank you Kat for your advice. I learned that the U.S. Embassy notary service is limited and does not handle this type of document, which I have now sent to the County Clerk of New York. When it comes back, I will finally be able to send it again and finally get the Apostille. Getting a notarization on a birth certificate that already has the apostille seems confusing: wasn’t the notarization already present to be able to get the apostille? (According to my information, a birth certificate can only be notarized by the county clerk of the state in which it was originally issued). I also learned that the payment procedure for doing this is especially odd. I had sent a bank check for the required amount of $3.00 (it costs about 40.00 euros to draw up such a check) and despite my request to be contacted in the event of any problem, all documents were sent back again by post with an explicit request for cash payment to be sent by mail. I have sent everything back with 3 …one dollar bills in the envelope. The article is clear, but I’ll still answer your question. Every document that was issued outside of Greece and will be used internationally needs to have an apostille. Since your grandfather was born in Greece, any docs pertaining to him that were issued in Greece are fine ‘as is.’ If you, your father and your children weren’t born in Greece and don’t have documents issued in Greece, but you intend to use them to register and claim citizenship in Greece, you need to apostille them all. There was once an underlined link for the USA, but all federal websites are archived and started from scratch when there’s a partisan change, such that occurred in the last election. The page I had linked is gone and hasn’t bee replaced to date (new list added 2011). State/local government websites stay relatively the same, so you need to look up the county/district website that applies to where your U.S. docs were issued. For example, if you were born in Brooklyn, you’d need to seek out the relevant office in Queens county to issue an apostille. If your children were born in Oakland, California, you’d need to get an apostille from the Alameda county office. I’m writing to ask if a couple from the UK wants be get married in California, is an apostille required for their marriage to be legal in the UK? According to the official UK government website, you cannot register an overseas marriage. See “Overseas marriages and civil partnerships” and “Depositing marriage and civil partnership documents from overseas.” I found these by doing a simple Google search. As my article explains, an apostille is required to certify the authenticity of a foreign document for international use. Therefore, it may be required in other bureaucratic processes, but the instance in which you inquired isn’t one of them. As an electronics engineer who designed computer chips, seeing how these incompetent bureaucrats think and operate with their old stupid anachronisms, creating make-believe work out of nothing instead of modernizing and moving forward, they are moving backwards. They look like animals with 4 back feet trying to get somewhere but never getting anywhere. We have the technology to fake every stupid document, and they would never find out because they are not crosschecking to see if these documents are real or fake. US corporations get documents from colleges directly to avoid fraud. In an world where information should be moving at the speed of light, countries that are still dealing with paper are cutting every green oxygen producing tree and destroying the environment. We can move trillions of dollars by wire but not official documents. If anyone wants to go to Greece and deal with its bureaucracy, I will pay his one-way ticket provided he will not return. I apologize for my late response. You make a very good point. Greece is known as a destination where people can obtain fake documents, and there is a lot of unnecessary paper shuffling and loss of files. As you said, what a waste of time, money and trees. Bureaucracy could be simplified by embracing technology, but people need to have skills to operate, maintain and repair it. I don’t know how this country can go forward when the majority of people cannot operate a computer, ADSL penetration in Greece is frighteningly low, and we don’t even have competent staff for hospitals. Other countries solved this problem by repatriating their diaspora and embracing immigrants, but I don’t see it happening here. Xenophobia is still on the rise, and a recent study by the University of Macedonia in Greece found that 84.1 percent of Greeks abroad prefer to stay there. I understand that the document(s) I am taking to Greece (birth certificates, marriage certificates, death certificate) need to be translated, which I have done, and have also received my “stamps” of approval from the Greek Consulate here in LA. I have also obtained an Apostille for each document… my question is does the Apostille ITSELF need to be translated as well? Or is it ok in English ? Thanks in advance for any clarification you could provide… Also, one more question ! I will also be taking my baptismal certificate with me, which I can have translated and also “stamped” from the Greek Consulate… however I cannot obtain an Apostille for it as the Sec of State does not notarize priests… any advice on this matter as well? Regarding the first question about the apostille letter needing to be translated to Greek, it does. I don’t expect you to know this, but I say so in “Official Translations to Greek” where I mention that a separate form is needed when requesting translation. This is sourced from my first-hand experience. Thank for giving me the opportunity to update my article to answer future questions similar to yours. Under the heading “In South Africa,” click the link and follow the instructions for getting an apostille. All best. In Iowa, vital records with apostille may be ordered by phone. In one case a fax of an ID was required. When ordering by phone, you can request that the records be sent across the hall to the Secretary of State’s office for an apostille. Two charges will be made to your Visa or Mastercard and in about a week the certificates and the apostilles will arrive. You must attach the apostille yourself. Selfserve photocopiers at major photocopy/shipping chains make two sided color copies which could be take in to the consulate to be stamped as true copies of the original. Many states contract with a company. It requires an extra fee, does not seem to have an option to add apostille, but ordering can be done through the web. I was wondering if anyone could help. I have to obtain a Apostille for our marriage license to be recognized in California. I attempted to call our Greek Agency but they are closed. My husband and I were married in Corfu (Kerkyra) Greece, July 3, 2010. We had an Orthodox wedding, and all legal paperwork filed in Greece. But not at home in California. We need for our marriage license to be valid and recognized in California. We have official (& notarized) the Marriage Certificate which has been registered with the Preficture /County of Kerkyra. 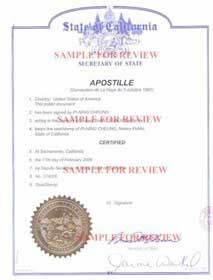 Last time I spoke with the State of CA they wanted an Apostille (certification) from Greece. We have a an official certified copy of the marriage certificate, and it is stamped that it is registered with Nomarhia of Corfu, signed & stamped. Now how do I go about getting an Apostille from Greece as requested by the State of California when I am not in Greece? I contacted several agencies all in California whom have told me I need to get this from someone in Greece. (Who?) How? what can i do it has been more than 400 days, and I have not had my marriage recognized by California and I would like to be done with this paperwork. A marriage conducted and registered/certified in Greece is also recognized as a valid marriage in California, USA. It doesn’t matter how many days pass. All an apostille does is authenticate a foreign document for international use. It does not make your marriage suddenly valid or more valid in another country. Hi there and thank you for the response, our county (Alameda county) has requested a Apostle from greece. You have indicated that the marriage is certified in Greece and recognized by the USA, and so I do not understand why it is still being requested? Is there something that i am not understanding? They have asked us to bring in an Apostile, to be registered in our county as a legal marriage. So I am really having a hard time figuring out what my missing piece is, and how i can obtain it. I truly appreciate your response and your help, as I have called the consult and even metropolis and get conflicting info. I believe the main issue is misunderstanding terminology. For whatever reason, you still think your wedding/marriage wasn’t legal. You got married in Greece, the marriage was registered and certified in Greece. It’s legal. A legal marriage in Greece is recognized as a legal marriage in the USA. An apostille doesn’t certify or recognize your marriage as legal. An apostille authenticates your marriage certificate from Greece (a foreign document) for international use (for use outside of Greece). Authentication is not the same as certification — look it up in the dictionary — but you keep using them as if they’re interchangeable. Alameda country is requesting an apostille on your Greek marriage certificate because the document is not American. It’s foreign. That’s it. As it says in the article above under ‘In Greece,’ you need to get an apostille for documents originating in Greece either in Greece or arranged through the Greek consulate/embassy. Good luck. I went to a Greek Embassy in Germany and they refused my American birth certificate because they said it didn’t have a “stamp” making it valid in Greece. I did have an official translation made, signed, and stamped by a lawyer in Greece. What is this stamp on my birth certificate they are requiring me to have? Where can I get it? When you want to use a document outside the country it was issued, you need to get an apostille. So if you’re trying to use an American document outside the USA, you need to have it authenticated back in the state/county it was issued so it is suitable for international use. It’s explained above. Further, you should have had the apostille applied first, then translated. Why? Because you need to have the apostille translated also.